Since debuting on the App Store earlier this year, HipGeo has given travelers a place to capture location-aware photos and text when they’re on the move. The latest version of the trip journal app released Tuesday adds a bit of motion of its own, with the addition of video support. HipGeo aims to help users automatically log their locations as they travel and shoot photos of their journeys. Those geo-aware images are saved along with any text the user enters and used to create a journal showcasing the trip. The images and posts are laid out on a map pinpointing where the user has been; users can then share their travels on Facebook, Twitter, Pinterest, or on HipGeo’s website. The idea, explains HipGeo co-founder Rich Rygg, is to make it easy for users to tell a story about their travels within the context of where they’ve been. “It takes point-shoot-save and turns it into a compelling story,” he told Macworld. And it does this automatically, without requiring users to painstaking log their location. Tuesday’s HipGeo 2.1 update adds video to the mix. The app’s camera feature now has a switch that lets you toggle between still images and video, just like on your iPhone’s built-in Camera app. 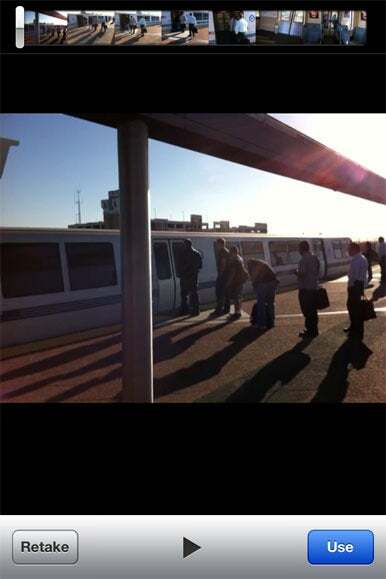 The addition of video support now allows users to upload video of their journeys, just as they would photos. 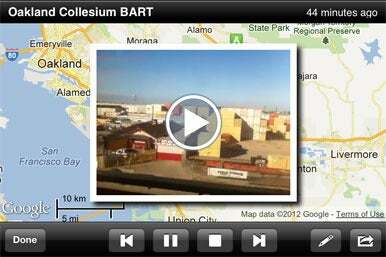 With HipGeo 2.1, you can upload video to the travel journals created through the geo-aware mobile app. There are a few caveats, however, as I found out when taking the app for a test run. You’re limited to 30 seconds of video; anything longer will produce a Video Recording Stopped message from the app. You can also only use video shot from within HipGeo. That’s in contrast to photos, which you can pull from either your camera roll or Instagram in addition to shooting them from within the app. 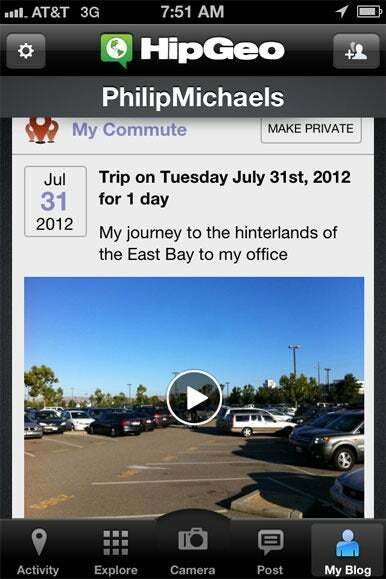 After downloading the HipGeo update Tuesday morning, I used the app to record my commute into the Macworld office today. All I had to do was launch a trip in HipGeo and post the occasional photo or video from my journey; the app recorded my travels the entire time in the background. (When uploading photos and videos, I could also enter in a location if I wanted.) HipGeo’s goal is passive, persistant tracking without draining your battery, according to Rygg. I did notice a bit of a hit to my iPhone battery during my commute, but to be fair, I was also downloading mail and checking up on Twitter while HipGeo was doing its thing in the background. During more normal usage—that is, if I were busying enjoying a trip rather than fiddling with my phone during a tedious commute—I imagine my battery life would have taken only a nominal hit. HipGeo plots out your travels on a map, embedding photos, videos, and text of your travels. It’s not exactly an epic tale, but it illustrates some of the basics of the app. And imagine if, instead of chronicling a rather mundane train ride, I was traveling up and down the California coast or visiting the London Olympics, posting video and photo updates all along the way. Note that if I were traveling overseas or someplace where I didn’t have a very good network connection, I could have opted to post in background mode on HipGeo; the app would have saved my activity and then posted once Wi-Fi was available or when I was back in an area that would rack up crazy roaming charges. I’ve opted to make my HipGeo test public, but the app gives me options for who I want to share my travels with. If I wanted, I could keep my travel journal private or share it with select people. HipGeo also boasts a community of users who’ve shared their own trips. Photo and video journals appear in the app’s Explore tab. And as with any app with social network aspirations, you can opt to follow other users to vicariously enjoy their comings and goings. HipGeo 2.1 is available from the App Store and runs on iOS 4.0 or later. The iPhone app will also work with camera-equipped iPads, though it runs in iPhone emulation mode. There’s also an Android version of HipGeo, but that app hasn’t been updated to support video capture.